Just like each and every artist has their favourite instrument to use, chord to sing, or lyric they write, every listener has a favourite streaming service. We love Deezer here at Spinnup, and as one of the service’s preferred distribution partners, the feeling is mutual! The French-born service is the most popular for streaming among Francophone audiences. So if you want to know how to get your music on Deezer and increase your chances of playing in Paris, you’ve come to the right place. 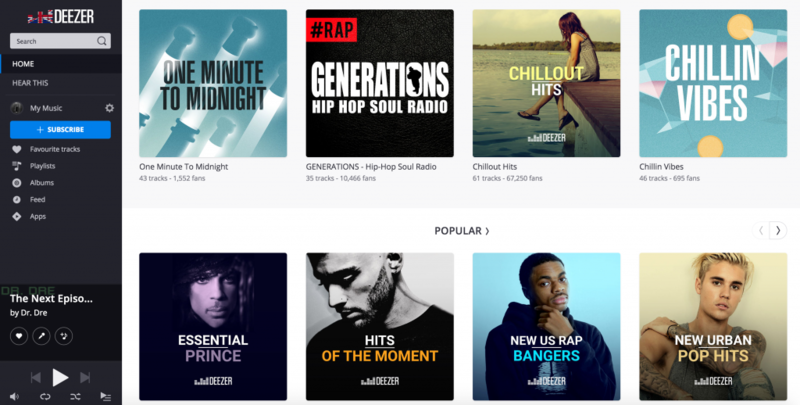 Deezer is an on-demand streaming service…you probably knew that already. But did you know that is available in a huge 182 countries, with over 43 million songs and 10 million users! Deezer is the place for discovering new music. Not only do you have access to the largest streaming music library around, but Deezer’s editors pick and recommend albums, tracks, playlists, and its own artist-based radio channels. With Deezer radio you have access to more than 30,000 radio channels to surf and explore – we dare you to try and get through them all! You can discover these by searching by artist or genre, or even better, curate your own playlists. But wait, there’s more. There’s Flow. This is what makes Deezer seriously cool. Flow is a personalised radio created just for you. It’s generated by the fancy algorithms we hear so much about in the news, which analyse the songs you play, the artists you follow, and the playlists you put together. Based on all that info it puts together a station made up only of music it thinks you will like. Can’t decide which album or artist to play today? No worries, just click play and let Flow take care of the rest. We already mentioned how Deezer has so many millions of songs to discover, but how on earth are you supposed to filter through those to find undiscovered music you actually like? Thanks to Hear This, all the hard work is done for you. Hear This is your personal music matchmaker, which like Flow, uses your previous listening preferences, editor’s picks and suggestions from your friends you’re connected to on Deezer to present you with fresh finds in one central feed. Start listening and invite your friends to use Deezer to make full use of Hear This. If you have an artist or song you want to play, you can of course search for them as per normal, or dig deeper to come across new discoveries. On Deezer you can find new songs from almost anywhere by giving you the options to search by genre, or country of origin. Want to listen to Portuguese rap from Brazil? Go right ahead! Why do I need to be on Deezer? We get asked this a lot by artists. A lot of them think that if they are on Spotify and Apple Music or iTunes then that’s enough. But as we mentioned before, every music fan has their service of choice, and if you’re not on Deezer, then you are potentially missing out on millions of fans! Deezer’s intelligent and discovery and radio features, Hear This and Flow, set it apart from other streaming services out there. When we say it’s easier than ever for you to discover new music on Deezer, we also mean it’s that much easier for listeners to find YOU! Well that’s easy, sign up to Spinnup and create a release and we will do it all for you! Creating an account on Spinnup is free, you only pay once you start releasing your music – for more info on that, head to our Pricing page. To make a release, login to your artist account and hit the ‘Create Release’ button in the bottom left corner. It’s an easy step by step process which guides you the whole way. Deezer4Artists, or D4A, is Deezer’s hub for musicians who release their music on the platform. Here they provide tools to help artists grow, engage with, and maintain their fan base through their digital tools. Deezer Uploader, which pushes your audio content out to the fans that follow you, from track previews to exclusive mixes! Right now Deezer are hard at work updating all these tools to give artists the best possible service and experience, so you must contact Deezer directly to update your bio, profile and banner images, or add in links to your artist social media. You can contact Deezer 4 Artists at d4a@deezer.com. Please see below for the correct specifications of images and URLs that Deezer requires to update your profile. Please note: If your banner image has text on it, make sure the wording is concentrated either in the centre, or the far left or far right. When you submit a banner image it will hide your profile picture on desktop screens. Please note: If you have a banner image and a profile image, your profile picture will only be visible on your profile on mobile devices. Ensure all URLs contain http:// at the beginning. For example your Facebook URL will be: http://facebook.com/artistname. We will let you know once Deezer 4 Artists is back up and running, and you can login and make all the changes to your artist profile yourself. Click here to learn more about Spinnup or create your free account here. Read about some of our other retail partners, such as Apple Music and Spotify.